MILITARY ISSUE M49 5630789 Observation Telescope With M164 Case Length: 14 ½ in Power: 20x Field of view: 2 degrees 12 minutes. Color: Olive Drab Condition: Mint Made for the U. Military with Superior Materials and Workmanship NOT A CHEAP INFERIOR IMITATION! Note: We do not know the exact date of this item. It appears to be in great physical condition with very little use. 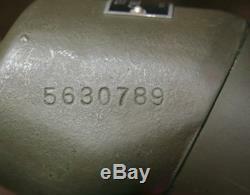 The pictures in this listing are photos of the exact item you will receive with serial #47895. The item is complete other than the scope is missing one of the screw caps at the end as shown in the picture. The M49 Spotting Scope, also known as the M49 Observation Telescope, is a multipurpose scope system used primarily for long range marksmanship observation. It is used widely today for observing and tracking animals for hunting proposes. The M49 is a fixed 20-power telescope with an eyepiece focus. It has a field of view of 2 degrees and an exit pupil diameter of 0.108 inches. The M49 is an erect image instrument that is magnified by the lenses in the eyepiece. The M49 does not have an adjustable sunshade; however, the front end of the body tube extends approximately three-quarters of an inch beyond the objective providing a permanent sunshade. The telescope is focused by turning the knurled focusing sleeve. Additional Information Length: 14 ½ in Power: 20x Field of view: 2 degrees 12 minutes. Item Condition Mint Condition Item shows very minor signs of light previous use. There is no damage to the item and it is in perfect working order. For the item's age, it is in great physical condition as the pictures shows. We accept all major U. We are unable to add more items to any orders that have already been paid. We are unable to substitute different sizes or colors. VERY IMPORTANT: If you wish to qualify for a combined/reduced rate do not pay for your items individually. Do You Have Other Sizes? Do You Have Other Colors? Do You Have More of These? Many listings have size and/or color choices available by using the drop down menu fields. If the size or color you need is not in the drop down menu or greyed out, we are temporarily out of stock. We are at the mercy of the U. Due to the large volume of orders we receive we are unable to contact customers when new stock arrives. Most listings will have 2 to 3 choices available. Please be aware that occasionally the tracking status will appear as though the package has not left our warehouse. If you check back in 24 to 48 hours most likely the tracking status will update showing the package has been scanned as it gets closer to its destination. Government has export restrictions of military surplus items to certain countries. Please also be aware that occasionally the tracking status will appear as though the package has not left our warehouse. I Received the Wrong Size, Color or Item And Other Issues With Your Order. Please do NOT start a return! Please do NOT start a "Not As Described" case! VERY IMPORTANT: Select the FIRST option. If we mistakenly yep, it occasionally happens! We strive to answer all inquiries within 24 hours and most of the time we are able to get them answered within a couple of hours. We answer inquiries in the order they are received and y our patience is appreciated. Please keep in mind that we receive hundreds of inquiries daily. Military surplus please be aware that no two items are going to be alike. We do our best to inspect every item and put it into a quality grade with items in similar condition. This does not mean the item has been used or that it is not genuine U. This may happen because the military often buys items in bulk and 100 of the same item may have been sealed in a single package. Military surplus items may have slight variations by contract (each order the military made); these variations are not considered deficiencies. Be advised that it may be against the law to export certain military items outside the United States. Those items will be offered to U. Be advised that the U. That is why our listings are only offered to certain countries. Due to the large volume of inventory we have on hand we use stock photos on our listings that are representative of the quality of the item you will receive. We are unable to take photos of each individual item we sell; instead, we take photos of one item from each quality grade and feature those on the listing. Our military surplus items may have been sitting for extended periods in government warehouses collecting dust and dirt. We do not consider dirt or anything that can be easily washed out of the item as a negative impact to quality. All items are inspected and graded for condition and we check for holes, rips and/or missing parts. Important Information Regarding Genuine U. Many listings have a size and/or color choice by using the drop down menu fields. If the size and/or color you need is not there or greyed out , we are temporarily out of stock. Please be aware that we are at the mercy of the U. In addition, our used items will not always have the exact same condition even within the same grade. In this example the "intended use" of the trigger finger mittens is not affected by the staining which is to keep your hands nice and warm. In addition, some items may need laundering but all of the items we sell will be serviceable and any deficiencies noted in the listing will not affect the "intended use" of the item. All items have been properly demilitarized and cleared for resale Nothing Beats Made in the USA. 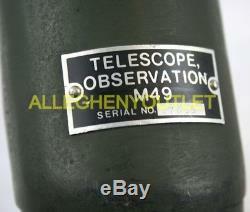 The item "USGI Military Vietnam M49 5630789 Observation Telescope Spot Scope with Case MINT" is in sale since Monday, April 02, 2018. 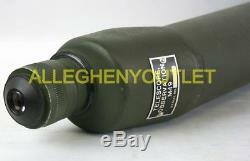 This item is in the category "Collectibles\Militaria\Vietnam (1961-75)\Original Period Items\Personal, Field Gear". 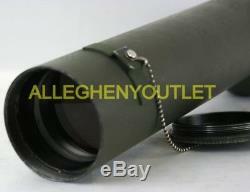 The seller is "alleghenyoutlet" and is located in Meadville, Pennsylvania. This item can be shipped to United States.